Last summer, we teamed up with Roadtrip Nation and Better Make Room to send three young people who are in college (or on their way!) on a road trip around the country to talk to folks who have overcome obstacles of all kinds to finish their education. As these three road‐trippers traveled coast to coast, they heard real stories and struggles, and got inspiration and lessons for the road ahead. Hear more from our interview with one of the road tripper’s, Estephanie. Estephanie is focused on growing into who she wants to be, and when something blocks her way, she finds a new way up. 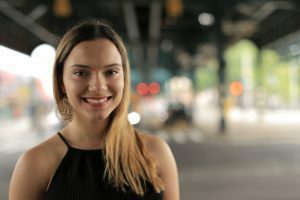 Raised in the Bronx by her mother, who worked seven days a week, Estephanie has been acting and performing for as long as she can remember, but arts education at her school was nonexistent. She got the spark she needed in an after-school arts program for inner-city students. Going from a school where she’d been teased for trying and striving, she saw what a difference one opportunity could make. After finishing high school in Miami, she moved back to the Bronx to attend college and study acting while working full time. This fall, she transferred to Lehman College for her final year of school. Even through the stress of paying for school, the hard work is worth it if she can help other kids like her find that spark to become who they are, too. Tell us about yourself and why you chose to go on this road trip? I was born in the Bronx and grew up with mom and brother. At 14, my family and I moved to Florida and despite the move, I managed to get good grades until high school when I started skipping school and my grades dropped. I struggled with behavioral issues during the transition, but in the last three years of high school I found my motivations through the Thespian Honor Society. I also found Urban Art Beat, which helps get kids off of the streets and allows a platform for creative expression through art. I am an adventurous person and love traveling. I would love to explore my heritage in Cuba and the Dominican, but I have only been exposed to New York and Miami. This road trip will not be my last adventure as I plan to explore and expand my perspective by meeting new, inspiring people. What was your favorite moment during the road trip and why? This is a really difficult question; there were so many. The conversation with Michelle Obama and seeing college-bound students ask her questions was a highlight. I enjoyed watching her give back and genuinely care about the students. Mrs. Obama gave them the confidence to start college. What are some of the biggest lessons you learned from this trip? Being able to adapt. I learned this and got to test it out on the road. It’s bizarre and different to be on the road and see how that applies not only on the road trip, but in real life. I was in a transitional period of my life during the road trip, transferring from one university to another, and felt discouraged that I was leaving my dream school due to financial issues. But because of this trip, I was able to look at life in a new light. I was able to look on the bright side and take every opportunity and advantage that comes my way. I’m applying that right now as I’m starting my last year of college. Who was your favorite leader to talk to and why? Elaine Del Valle! She is doing everything I want to do. She’s a multitasking artist who wears many different hats. I love that she welcomed us into her home; that speaks volumes about her as a person. I related to her in many ways; her first show was “Grease” as Sandy and so was mine. We had many commonalities, and she let me audition for a role in a movie. I didn’t get it, but she let me have an opportunity and that was amazing. What is a fun fact about you that you’d like to share? I can lick my elbow and it’s funny because I told that to Jim St. Germain and he tried it—unsuccessfully. Final thoughts: I want to thank everyone who made this road trip possible and extend my gratitude; this has been a great experience. There are ripples of this experience in my life and will be forever.